Lost your pet or found someone's pet? No one can recognise your pet better than you! 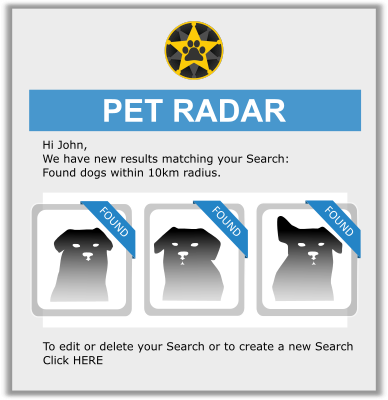 Once your lost or found pet is registered, Pet Radar will be set up for you by default. Lost pet owners will start receiving potential matches of found pets of the same type (cats, dogs, parrots, etc) and people who found a pet will see the new lost pet listings. 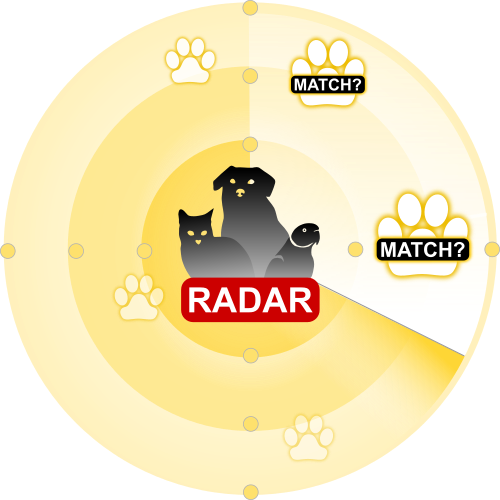 We setup your Pet Radar to show you matches within 10 km radius of where you lost or found a pet. But you can change and create searches at any time. Receive new matches by email or see all current matches available on the website in your Pet Radar tab. In your Pet Radar tab you can change the settings of your current Search and create a new Search. Creating a new Search is especially convenient for lost pet owners who have had a strong sighting of their pet in a different area to where it went missing. A new Search centred on the sighting location can be created to keep up with new found and sighted pets reported in the area. This feature is also availabe for volunteers and pet professionals who wish to be informed of new lost or found pet registrations in a paricular area. This makes pet matching easier and more efficient. Do you help by matching lost and found pets? Do you often get found pets in your clinic? Pet Radar makes matching easy. Get matches of new lost and/or found pet registrations straight to your inbox for any location you wish to monitor! 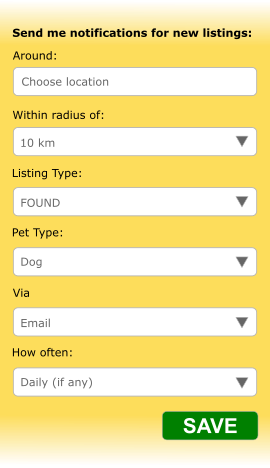 Select listing types (lost, found, both), species (cats, dogs, etc., all), location, coverage radius, frequency! Add your Pet Radar page to your browser favourites and review all of your Search results with a click of a button. You can create up to 10 Searches.